Car magnets are perfect and cost effective promotional items for your Vernon business. Why not to use car magnets while you commuting on your car or truck to your customers in Vernon. They will get you an additional business exposure while driving, stopped at traffic light or waiting in the traffic jam in Vernon. No additional skills are required to install car magnets. Just stick them on your car’s side doors or trunk and it is done. Easily removed when using vehicle for your personal needs. Not sure how to design car magnets for your Vernon company? Our professional, creative and experienced design team is ready to assist you with creating impressive car magnets. We will design car magnets for your Vernon business to make sure that they look amazing while delivering the clear message to your clients. 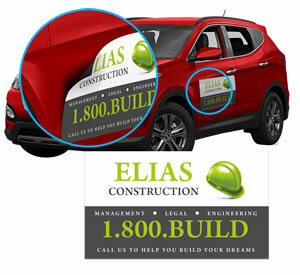 If you have any questions about car magnets or design services that we offer please contact us and our product specialists will be happy to assist and guide you over the phone, email or in person to find the right product for your business in Vernon.